The Sun and new Moon begin the journey of the next lunar month at 1° 07’ of Libra a hot spot in cosmic geography known at the Super Galactic Center. 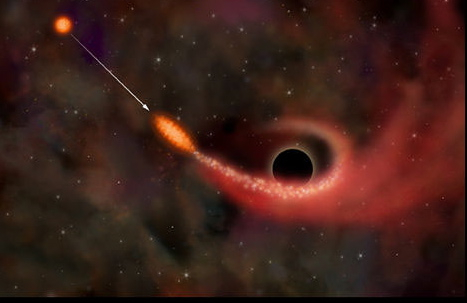 The Milky Way revolves around this black hole, and it is has a powerful parallel for anyone obsessively in love. Astrologer Philip Sedgewick makes a parallel to this kind of relationship to explain the power of the black hole.. Remember that Libra has much to with relationships, which are to be an act of balance. ‘As reported in Carlos Castaneda’s The Art of Dreaming, one of Castaneda’s initiations consisted of encountering a nagual, or sorcerer, known as the Defier of Death. The Defier carried a reputation as one of the oldest living sorcerers who would appear and make a deal with Castaneda. The nagual needed Carlos’ energy to continue on and would grant him something in return. It had to be an agreed deal – nothing could be surmised or assumed by presence or proximity. Castaneda persisted in just trying to “give” his energy to the sorcerer, but she (who was just recently a “he”) would have nothing of it. Don Juan, the sorcerer under whom Castaneda studied for years, warned Castaneda that this transaction could kill him and yet, was unavoidable. As the deal went down, the sorcerer granted Castaneda the ability to dream and gain total intra-dimensional perception such that he could perceive the nature of energy. Castaneda slipped into an altered state of consciousness that apparently lasted overnight. When Don Juan finally found Castaneda, he had existed in the shifted consciousness for nine days. 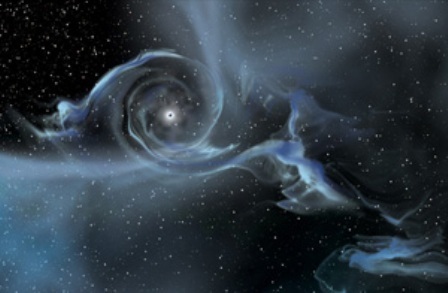 As one in love often reports, “How time flies when you’re having ecstatic fun.” Regardless, an extreme, possibly cosmic energy transaction resulted, mutually benefiting both parties, despite the potentially doubtful appearances of the deal.’ http://www.philipsedgwick.com/Galactic/ZS.htm. 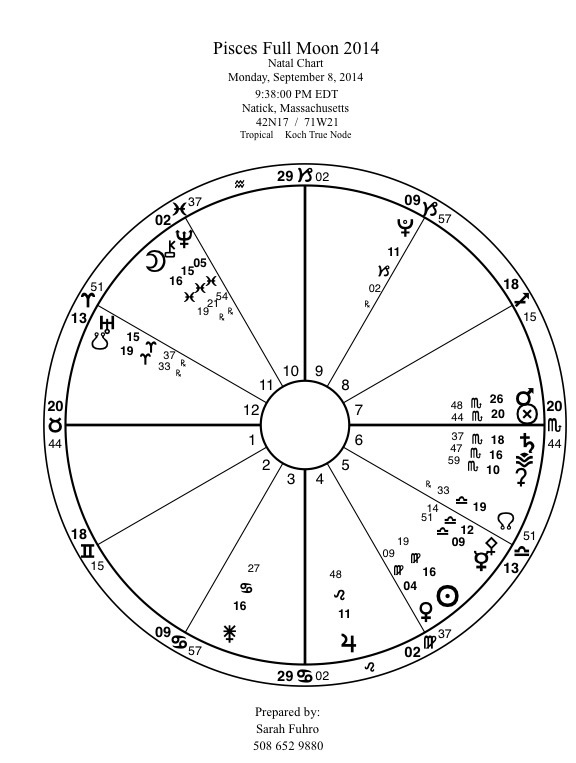 Another powerful place in this chart is the square between Mars in Sagittarius and Neptune in Pisces. Mars in Pisces knows that he is right and justice demands action. 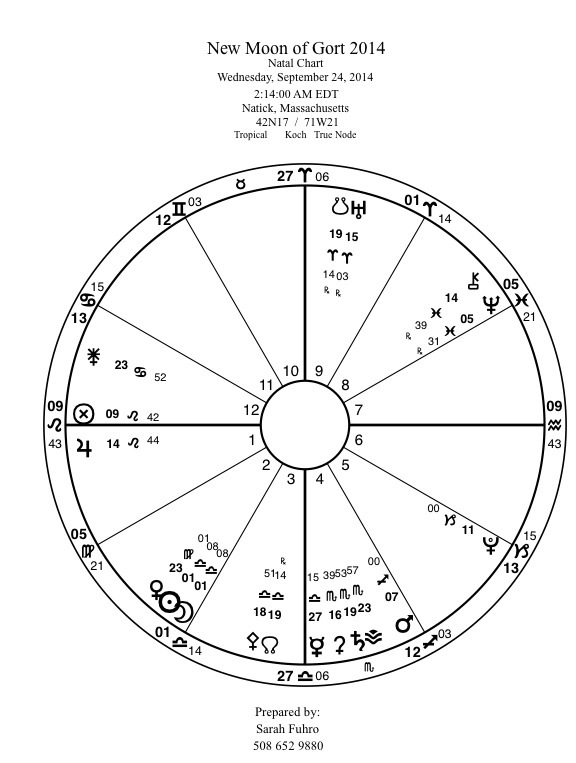 Neptune in Pisces looks into an oceanic miasma and asks how Mars can be so certain. Mars in Sagittarius can combine with Neptune in Pisces through song and meditation. This might be the combination which will change the political climate. As the righteous anger of Mars combines with the compassion of Neptune, love and deep understanding may prove to be a greater weapon than anger. Gort is the Moon of Ivy, a vine which grows in spirals, a representation of resurrection, to return again on each spiral round of the journey. It was ivy that Bacchanals chewed in their mad revels in honor of Dionysus. 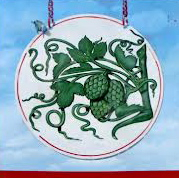 Ivy is the traditional symbol of the wine tavern in England. it seems a suitable symbol for the astrology chart which also moves in endless circles round our earth. Once again the Moon and Sun face off. 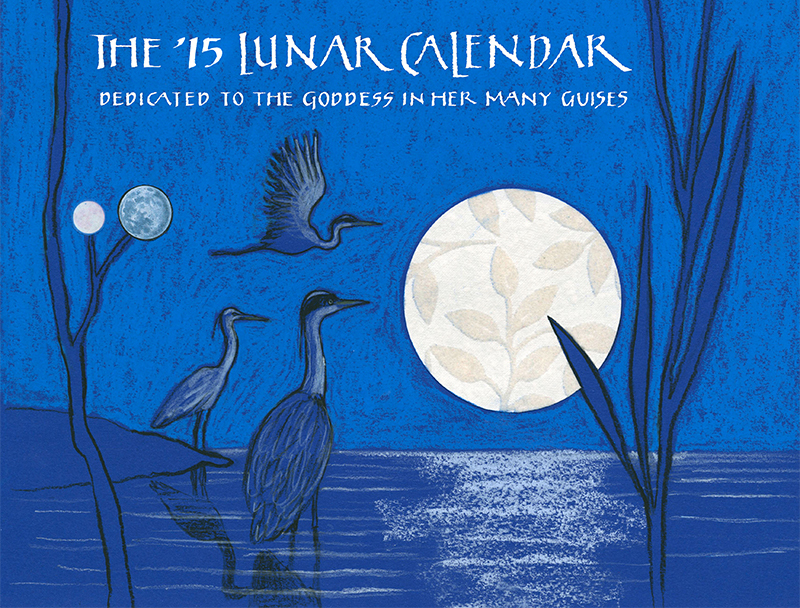 We have the fifth ‘super Moon’ of the solar year because the Moon is at her closest approach to earth. The excitement of the opposition between Sun and Moon grows as the Moon swells! We are aware of all that must be contained in this time of bright moonshine. The crickets and cicadas take out their violins and castanets every evening to play the wild rhythms that are in our bodies and blood as well. What is the rhythm of your heart? How often do you take time to listen to the beat? When it comes to hearing our heart’s desire, Virgo and Pisces have two styles of response. The Virgo in your chart might want to incorporate yearning into a daily ritual or service project. Your Pisces house and planets will cling to the original impulse of desire, adding depth and purification. In this way we incorporate the ‘in’ breath and the ‘out’ breath, the diastolic and systolic drum beat of the heart! 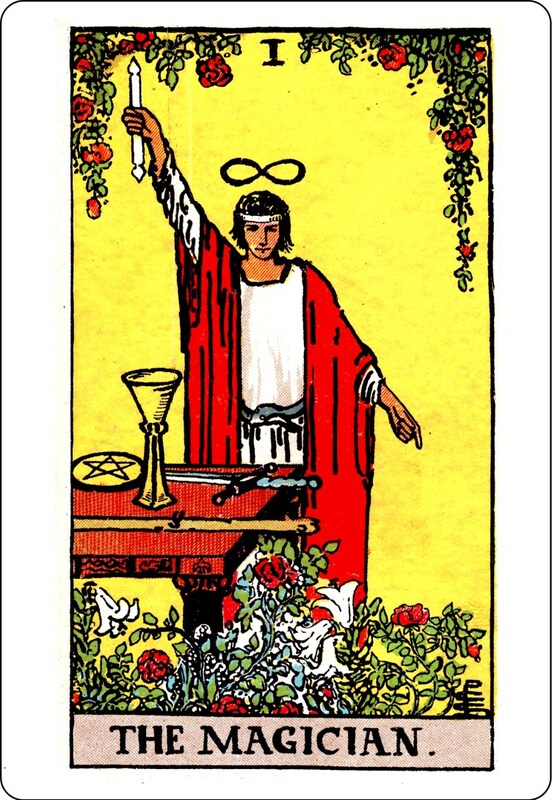 In the Tarot deck, this play between the original impulse of desire (the Rose) and refinement (the Lilly) is symbolized in imagery, which appears so often in the cards. I have chosen The Magician in his rose and Lilly garden because he represents Mercury. In the chart for the moment of this full Moon, Mercury, the ruling planet for the Sun’s sign of Virgo is with Pallas Athena, an asteroid named for the goddess of wisdom and war. They are involved in the ongoing square between Uranus and Pluto. Mercury thinks and communicates, and, like the Magician in the Tarot card, can create through imagination and illusion. We live in tricky times and only by walking in balance can we make our way through the tight spots. Right now, Mercury is situated in Libra symbolized by the scales, and we approach the equinox a time of balance between light and dark. Justice is always an issue with Libra planets. 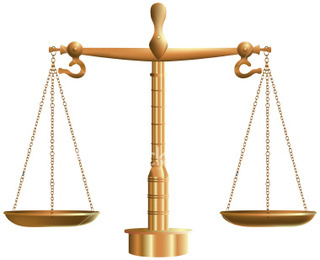 Injustice clamors for adjustment, for harmony and balance. We should also be aware during this full Moon moment that Chiron is with the Moon. We can’t see him as the Moon rises at sunset, but he is there, a promise of healing. Chiron was the great physician, who could heal any wound but his own. 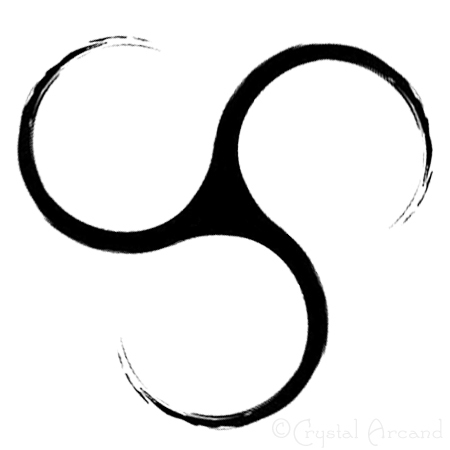 Each of us his has him in our chart, a reminder that there is a wound, which cannot be ‘cured,’ but can be the key (Chiron’s symbol), to healing others. Virgo and Pisces are healers in two different modes. Virgo is the practicing physician; Pisces offers the compassion, which must be applied to the wound. Chiron can use that combined energy to remove barriers to a healing solution. As earth people, we experience the suffering of the Ebola epidemic, and know we are challenged as a species, medically and spiritually to respond. The doctors and nurses who are dying with their patients need an epidemic of healing attention. A Water ‘trine’ is part of this chart. Water is the element of emotional understanding. Moon and Chiron in Pisces, the asteroid Juno in Cancer, and Saturn with Vesta in Scorpio are whirling in the ever moving element of water. How might all of this impact your life? Try to piece out this soup of issues: marriage, an investment to a mystical source, the emotional risk of healing. 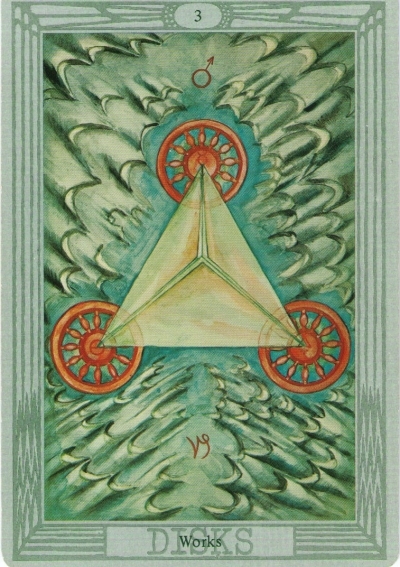 The three of pentacles from the Thoth deck combines the Earth element of the Disks (Pentacles) with the Water imagery of this trine. It is also a good description of the opposition between Virgo and Pisces, and why I call it a dance rather than a conflict. A triangle (trine) is stable structure, but it keeps a vibrant rhythm, ready to twirl. 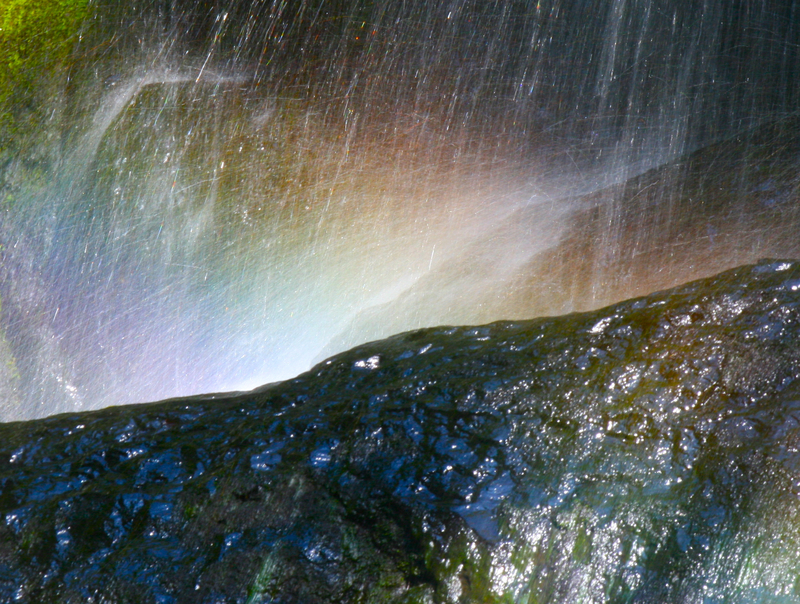 This Water trine gives us the opportunity to explore our feelings and sort our responses to pain and joy. Like listening to heart, sorting our feelings, gives us the opportunity to own them, to learn from them, but to understand their sources and limitations as well as their truths. After I wrote this blog, I went downstairs for breakfast. 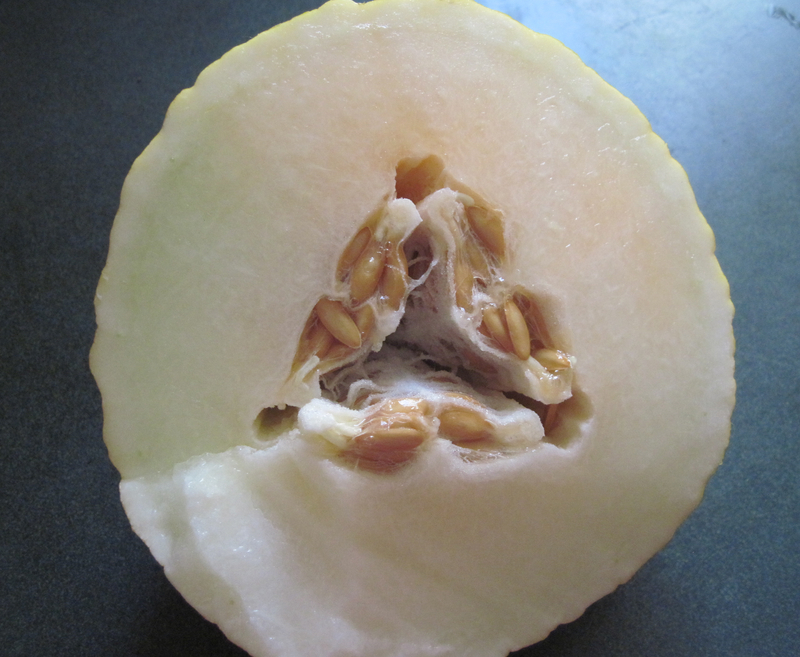 I cut open a casaba melon from the farmer’s market. Here’s what I found!